Thank You For Sticking With Us: We’re Back! Hello, it’s been too, too long! Thank you for checking out our latest update after a lengthy period of quiet. 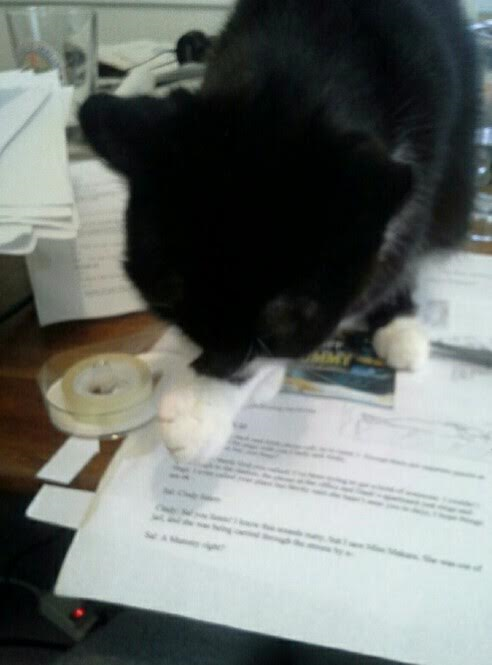 The reason for the quiet is, both Delia and I, have been dealing with a few very personal setbacks. Due to those obstacles, our plans, con appearances, and work on the book had to be put on pause. And it’s a much longer pause than either of us would’ve liked. We’ve been eager to update everyone on the progress of the future issues, and at last we feel we can present everyone with some concrete updates. As we finish The Case of the Mysterious Zita Makara, Delia will be taking a step back as the lead artist on the arc. She’ll be doing a few pages in issue 5, and will be rounding out issue 6 with The Epilogue. She will also continue on as letterer for the next two issues. In our next update, we hope to give you a few more details on what caused the great pause on the series, and our future plans for Dash. Taking the reins for Delia on the bulk of the next two issues, will be artist Vincente Rico. Delia and I are excited about his take on Dash and the world we’ve created. The pages he’s kicked out already have been incredible. Vincente was the artist on Fake Empire with writer Eric Palicki from Darby Pop Publishing. Check out more of his stuff here. Vincente is currently inking issue 5 and our goal is for both issue 5 and 6 to hit the stands this fall. This is just a small taste of his work on the final act of The Case of the Mysterious Makara! 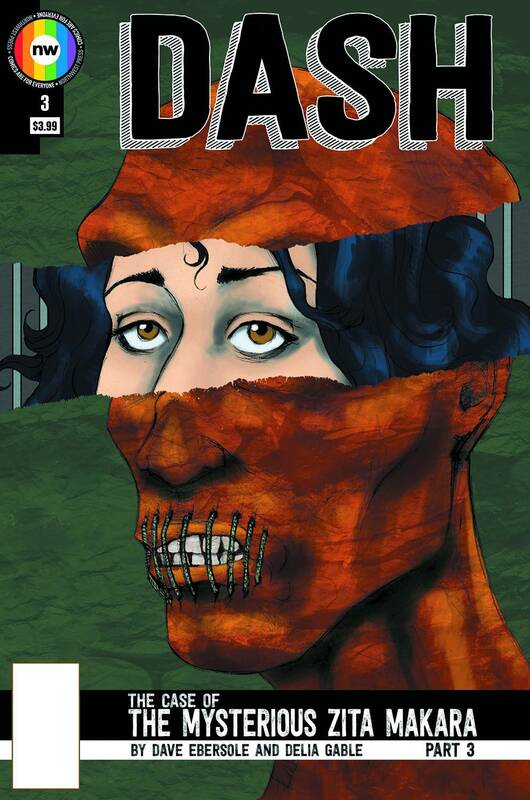 Also coming in the near future, is a standalone Dash issue titled The Case of the Man Behind The Mask. Artist Sean Von Gormon and I have been working on this for a while, and we’re happy to be able to finally announce it. If you aren’t familiar with Sean’s work take a look here! In this one shot issue, Dash takes a case where he goes undercover in Hollywood to get the skinny on one of Tinseltown’s biggest stars. But will he be willing to climb over a few skeletons in his past to get the truth? 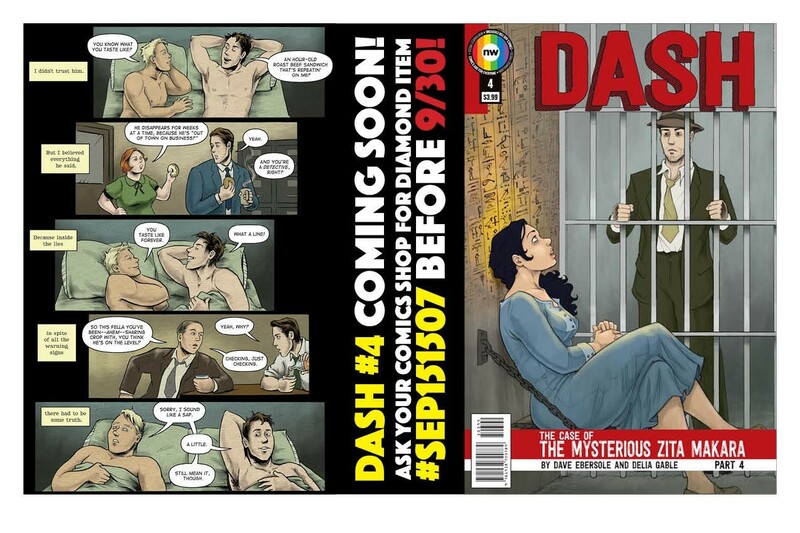 Dash: The Case of the Man Behind The Mask will be available this year as an exclusive digital issue from Northwest Press. It will be included in print in the upcoming Dash collection, along with The Case of The Mysterious Zita Makara, and two brand new short stories that we can’t talk about, just yet. Lastly we just wanted to thank you for the emails, Twitter comments, Facebook messages, and some good natured harassment about where we’ve been. Dash is coming back in 2017, and we can’t wait for everyone to see what we have in store! It’s been a while since we updated, we were going to start this blog update with “Happy New Year!” but by golly, seems January is almost gone! First off, we want to thank everyone for sticking with Dash, and for the continued positive feedback we’ve received on the book. We had originally planned for the book to be released a heck of a lot more timely than it has been. There’ve been a lot of factors contributing to the delays, some in our control, some completely out of control. Thank you for sticking with us, and a big thank you to those who contributed to the Northwest Kickstarter campaign this past fall that ensured issue 4’s arrival. Going forward, 2016 is shaping up to be a busy year for us. Our goal is to turn issue 5 into Northwest Press mid-March, with a late Spring release. By June our aim is for Northwest Press to have issue 6, so ideally people will have it in hand by San Diego Comic Con. After that we’ll be putting all our efforts into the Trade, which will include brand new stories with some fantastic guest artists, new and updated pages from the original arc, along with issues 1-6. The next two issues will be a few pages longer than the previous issues, which gives us a little extra room for some fun stuff, including pinups from some fantastic guest artists. 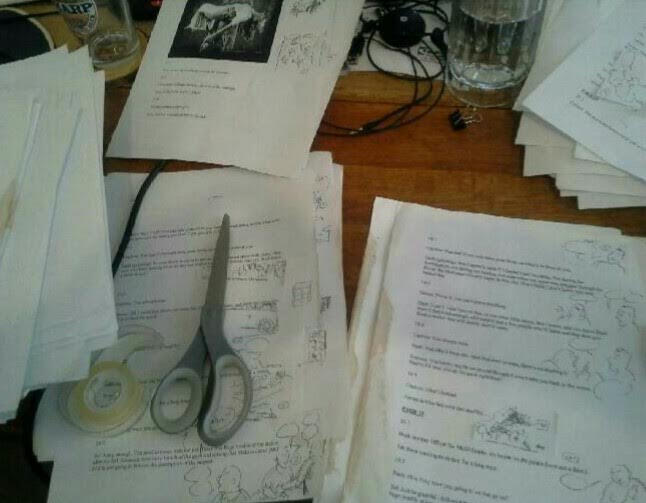 Issue 5 is underway–here’s a pic of the issue 5 script edits and thumbnails in progress. In the “things we haven’t mentioned” department, Issue 4 is out and Jordan Cruz of The Pulp, Foxy Jazzabelle of Black Girl Nerds, Leander Lacy of Capes and Scowls, and Andrea Speed of cXpulp had some things to say about it. Don’t forget, if you can’t find issue 4 in your local comic shop you can order it directly from Northwest Press. And digitally from Comixology, Google Play, Gumroad, and iBooks. Dave had a great time talking to the fine gentlemen from both Comic Book Bears and from Pop Addled podcasts this fall. Finally, Dash earned a spot on Pipedream Comics top Comixology Submit titles of 2015. Thank you all, once again, for the continued support, stick around as we wrap up The Case of the Mysterious Zita Makara! A lot happening this week. First Delia is the featured artist of the week on Pulp Cultured, check it out! 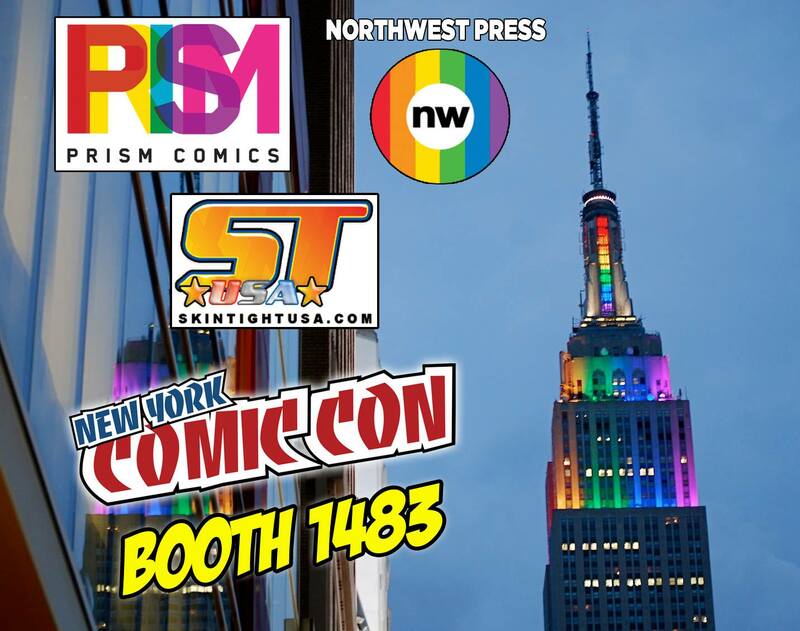 Also this week Dave will be helming The Northwest Press booth (booth# 1483 shared with Prism Comics and Skintight USA) at New York Comic Con. Be sure to stop by and say hi! Pulp Cultured is an up and coming website featuring all things awesome, including a tremendous support of indie comics. Recently they interviewed Dave, which you can check out here. Also check out their reviews of issue 1 here and issue 3 here. This site is run by good people with great taste. Keep an eye on them! If you can’t find issue 3 at your local comic book shop you can order it from directly Northwest Press for both digital and print copies, or Gumroad, and Comixology for digital releases. We also want to thank Comixology for making us their featured creator submit comic this past Wednesday! If you do the Facebook we have a Dash page on there. If you’d give us a “like” we’d be very grateful. Also if you click on The Comic page you’ll find what the cover for issue 6 looks like and preview page for issue 4. The Reviews Are In, Pre-Order Today! 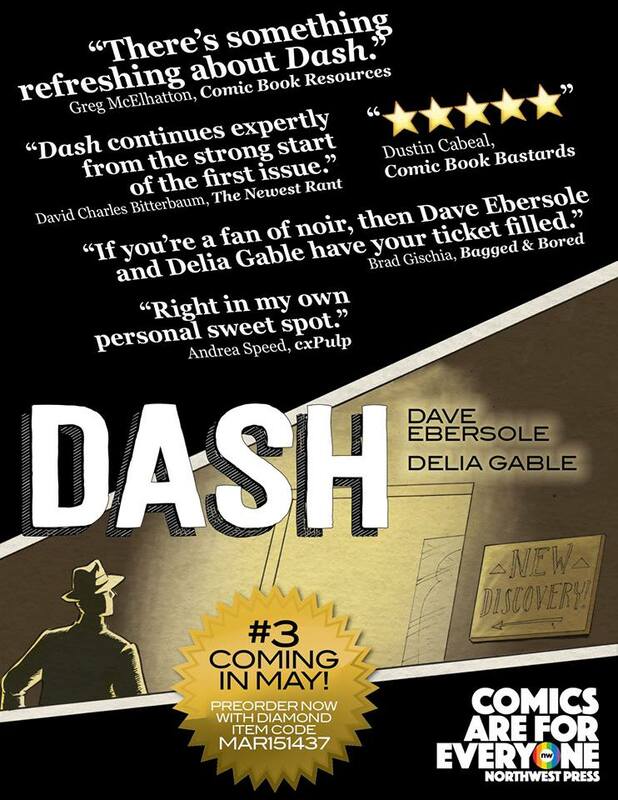 The reviews are in, let your local comic shop know you want them to pre-order Dash 3 today! You can also check out all of our reviews and interviews in our press section here.